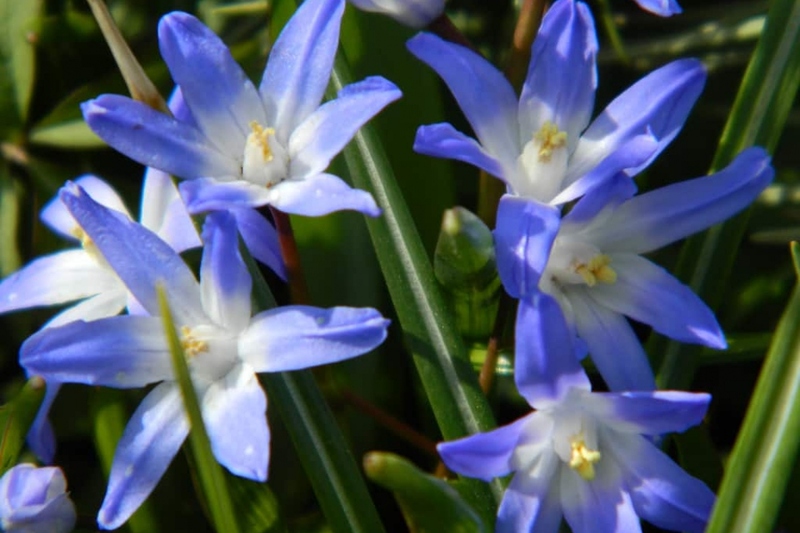 Glory-Of-The-Snow (Chionodoxa forbesii): growing, planting, caring. Deep-blue stary flowers right at the end of the winter! Chionodoxa forbesii - Forbes' glory-of-the-snow - is a bulbous perennial of the genus Chionodoxa native to south-west Turkey. It is a dry bulb, with small deep-blue upward-facing flowers, flowering in early spring. After flowering, it goes into dormancy until the next spring. Chionodoxas are small, early-flowering bulbs, between March and April. The flower stems have 2 to 12 flowers depending on the species. They are formed of 6 narrow petals blue, purple or pink, with yellow stamens and a white pistil. The leaves are thick, in the shape of thongs, erect, and they appear at the same time as the flowers. Plant the glories of the snow in the fall, or even in the late summer to allow the bulbs to root well before the cold weather. Planting is simple: bury them 5-10 cm in ordinary or poor soil, sandy, well drained, exposed to sun or partial shade. If your land is not very draining, put some sand in each planting hole. Little trick! To avoid rotting bulbs, roll them in wood ash before planting. Ash enriches the earth with potash and has a protective action against fungi! If you plant in a massif, you do not need to turn the soil very deeply and disturb it: prepare the soil locally by scratching it. In a lawn, bury the bulbs with a dibble. Throw them in the air, and plant them where they fall! In a pot, make a mixture of potting soil, sand and loam, and plant 5-10 cm deep. Water, tamping to leave no air bubbles. In cases where they are grown in pots inside, glories of the snow may require weekly watering in late winter and spring. The multiplication of the glories of the snow can be done by dividing the bulbils during the period of dormancy, in summer. But if you do not do it yourself, they will multiply well by themselves if appreciate their situation!